A few odds and ends for your Friday. Enjoy! Here’s a link to a recent piece on Old Colony Mennonites in Mexico. Old Colony Mennonites are the second-largest Plain Anabaptist group after the Old Order Amish. They share certain similarities with the Amish. Great photos and more info at the link. Richard Stevick, author of Growing Up Amish: The Teenage Years, will be in the Holmes County, Ohio Amish settlement tomorrow (Sat June 4th), signing books at The Gospel Book Store in Berlin. Rich sends word that he would be glad to meet any Amish America readers if you are in the area. If you are around, I encourage you to drop by and say hello to Rich. I think you’ll really enjoy meeting him. Rich and I finally had a chance to catch up in person when I dropped by on my recent visit to Pennsylvania. Here is a piece Rich wrote on Florida plain publication The Pinecraft Pauper. And if you haven’t read it, Growing Up Amish is great for understanding the Amish adolescent period Rumspringa. For those interested in learning more about the success factors of Amish business, Donald Kraybill, Steven Nolt, and I have a new paper that has just been published in the Journal of Enterprising Communities. In the paper we look at Amish business success from the perspective of different types of socio-cultural capital, including ideas of religious, human, and symbolic capital. You can find an abstract of the paper here. The Amish State Guide is nearing completion, with 23 of 29 entries finished. Recent additions include West Virginia and Colorado (with Nebraska and Delaware on deck). Thanks for your ongoing feedback on the many constantly changing Amish communities around the country. I plan to keep this guide as up to date as possible, and your input helps. I recently added 17 new entries to the Amish Online Encyclopedia, with more on the way. If you have a general question on the Amish, that is a good place to start. The AOE covers a wide range of questions, with examples including: Do Amish use birth control? ; What colors are Amish buggies? ; Why don’t Amish sue? ; and What holidays do Amish celebrate?. One of the new entries: Can Amish marry non-Amish? Interesting topics Erik. I love the picture!! Makes me think that two different cultures can share the same space or roadway in this case, LOL. Hope everyone is well. I am quite busy these days and life seems to be changing by the minute, LOL. Absolutely fascinated by this article. I’m going to have to do some more research on these people. Who would ever think that they would have Mennonites in Mexico. Thank you for this enlightenment. I enjoy all of your articles very much and always learn something new. It sounds like you have been very busy Erik, and i will check out a sample of your paper of “Amish success in business”. A number of years ago, there was a site called “amishinfo.com” that showed a map of the United States and Canada. You could click on a state, and it would show a map with the every community marked on the map, and a legend naming the community with the number of baptized members and church districts. It was really helpful in identifying new communities to visit. Do you think that’s something you might consider adding? Matthew I’d thought of something like that. One challenge would be building it and then also keeping it up to date. Number of baptized members sounds pretty ambitious level of detail. But possibly, it is an interesting idea. I wonder if you could build something like that using a Google Maps API? In thinking more about it, I believe it was households/families in community as well as districts, not baptized members. I believe the information was culled from a nationwide Amish Business directory that was published in the 1990’s, but surely you would have access to more current and/or detailed information than was in that book. Love the cyclists. Doing a Bike Across _X_ state is on my bucket list. 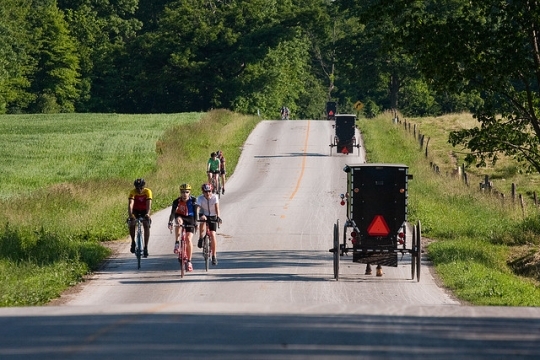 I imagine the Amish (and their horses) would much rather share the road with cyclists than cars. I also imagine that would be the perfect way to explore Lancaster County or Holmes County…except you wouldn’t really be able to buy a bunch of pies or produce if you see a roadside stand! Lindsay … my husband & I have often thought of taking our bikes up to Lancaster or out to Holmes County, but trouble is ( besides not being able to stop at all of the irresistable roadside stands )the roads are very hilly ( especially in Holmes County ) and you have to be in pretty good shape to conquer them because even the Amish buggy horses have trouble with them! The little Mennonite article has a slight historical error. The Mennonites in Mexico did not come to Pennsylvania with Penn. They are the “Russian” Mennonites who had come from northern Germany/Holland that settled in what is now Poland, and then to Russia. In the late 1800s they immigrated to Canada, then to Mexico, and eventually to Bolivia and Paraguay. There are about 40,000 in Bolivia and something like that many also in Paraguay. Belize has a few also. They were responsible for turning the empty plains of the Ukraine into “the breadbasket of Europe,” but left when Russia tried to force them into military service. I am waiting with great anticipation for the Ontario Provincial guide. I can let the “state” label slide since there has been Americans here in the province almost as long as there has been a province. I’m a little confused though, when I read about Amish here I don’t hear about colonies so much as I do in relation to certain Mennonite groups. Do these Mennonites live in communal settings or is it a reference to church districts? My blog Amish Stories is having its first ever contest this week. The First prize winner will win 2 tickets to tour the farm where the 1985 move “Witness” staring Harrison Ford and Kelly Mcgillis was made in Strasburg,Pa . This farm is now Amish owned, and the family has given permission for folks to tour their farm. This may be the last time anyone will be able to walk and see the same things that Harrison Ford and the other actors saw during the making of “Witness”. The Witness tour should last about 2.5 hours. In addition to the Witness farm tour tickets, 1st prize winner will also receive 2 tickets for Jacobs choice. There will also be a 2nd place prize, which will be 2 tickets for the Amish Homestead. Please go to My blog www.AmishStorys.com for contest details, and more information on the prizes. Richard from the Amish settlement of Lebanon county. Well, long weekend, nice to be back on and into the comments…Mike you are right, it looks like an “ultra-condensed” history on that site, like they hacked out a few crucial lines at the least. More value for its photos I suppose. Shom glad you let the province slide, it makes my labeling a lot simpler 🙂 I promise that when Amish are in at least half of Canada’s provinces I will consider renaming! Which may not be too long in the future…I got a little confused on your question on colonies, though. Heather, Lindsay, glad you enjoyed it! Matt, I bet you could. I have a few other projects on the burners right now but either way it is good to hear that there is some interest.